Why did Bobby Kennedy leave such a lasting impression on US politics and society? Revered equally across the political spectrum today, his rise to prominence was controversial. He became Attorney General at just 35 and gained a reputation as a tough operator during his brother JFK’s time in the White House. But when he was gunned down in 1968, America was riven by racial and class division as well as doubts over the country’s involvement in the Vietnam War. 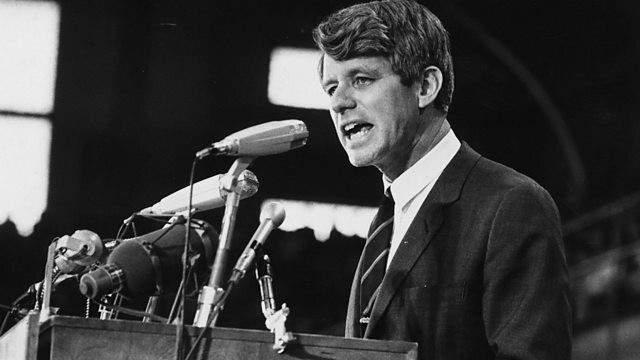 Senator Robert Kennedy came to embody the hopes and dreams of a generation seeking a fairer and more peaceful country. Fifty years after becoming the target of an assassin in the Ambassador’s Hotel in Los Angeles, Stephen Sackur speaks to some of the people whose lives were changed forever that day. Close aide Paul Schrade, who was himself hit in the skull by one of the assassin’s bullets and Vincent Di Pierro who found himself covered in the senator’s blood as he slumped to the ground give the closest accounts of RFK’s final moments. Legendary British interviewer David Frost (famed for his interrogation of Richard Nixon after Watergate) talks about the impact RFK had on him. And contributors speculate if another Kennedy may soon run for the White House with all eyes on RFK’s charismatic grandson, congressman Joe Kennedy who represents Massachusetts.